Combine action, adventure, and sci-fi elements, and N.O.V.A 3 delivers an exceptional gaming experience for your iPhone or iPad. 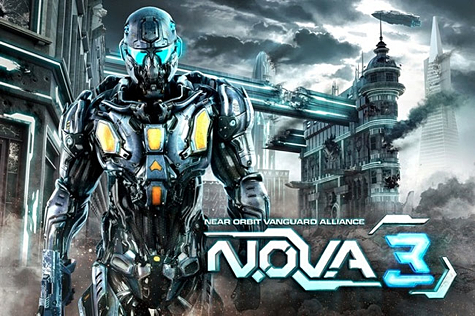 N.O.V.A 3 is a first person shooter game developed by Gameloft, one of the premier game developers for iOS. 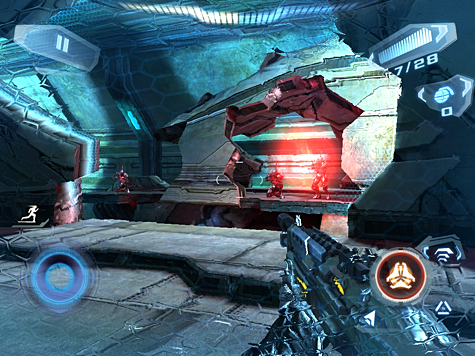 The N.O.V.A series has often been referenced in likeness to the popular Halo franchise. There are certainly elements of the game that overlap, although that is not by any means a negative view. You assume the role of Kal Wardin, a N.O.V.A commander, on his third outing in the franchise. In this adventure you will battle the Volterites in an attempt to save mankind, through a war-torn Earth. As you battle your way through surmountable odds, you will visit some of the most visually stunning levels ever seen on a portable gaming platform. Add the ability to play the game via AirPlay to your high definition television, and you have a setup that rivals dedicated gaming consoles. Whilst still shy of the powerhouse gaming systems, such as Microsoft’s Xbox 360, the quality of gameplay, graphics, and sound will certainly impress. Especially, if you are using a Retina enhanced display. Users of the New iPad, will be able to choose between a higher resolution or improved visual effects. Despite the high quality overall, there are a number of graphical glitches that are near game ending. If it was not for pure determination, and a few level and checkpoint restarts, I would have thrown in the towel many times. Gameloft is traditionally very responsive with regards to patching problems with their games. By the time you read this review, it is likely they would have resolved most of the bugs with an app update. Despite the bugs, the graphics are immersive and fluid allowing for ultra fast gameplay that is essential in first person shooters. It is worth owning this game just to showcase how exceptional graphics on iOS devices can be. Even more essential is the on-screen touch controls. They need to be accurate and responsive, and they are in N.O.V.A 3. Gameloft has gone to a lot of trouble to make sure gamers don’t miss physical tactile button controls. You can easily change weapons, throw grenades, take cover, and move briskly without looking for where the controls are. It also feels very natural and after a few minutes your muscle memory will kick in. The options allow for a few different control schemes. The most interesting control option is the inclusion of the gyroscope. Initially, it may feel awkward, but it is very responsive and gives an alternative to touching the screen. Moving your iOS device up and down, and side to side, will allow you to move the virtual camera around the world. It has the appearance and feel of a window into another dimension. Whilst the available control presets are useful, I would like to have seen customizable control options. Gameloft previously offered this customization in Modern Combat 3: Fallen Nation, with much success. The sound quality is nothing short of amazing. When playing this style of game I choose to use headphones to enhance the experience as much as possible. Doing so will allow you to hear enemies and gun fire approaching from various angels. 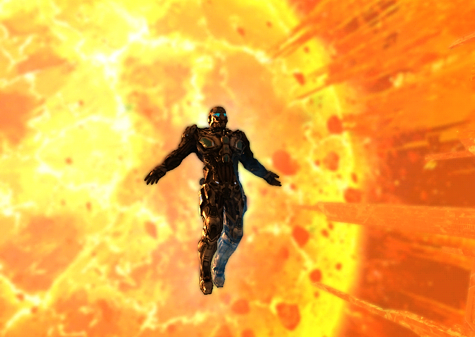 First person shooters generally lack a compelling storyline in the single player campaign. N.O.V.A 3 bucks this trend and delivers a story that is unique, but also allows fans of the franchise to continue their affection with the characters. The story is delivered via a series of cutscenes that are both delivered by voice actors and onscreen text. Unfortunately, the cutscenes are not sync’d to the lip movements of the characters. This is disappointing as it takes away from the emersion of the storyline. The foes you come across will do their best to prevent you from proceeding. Whilst they offer a challenge, you will find the process of elimination to be rather repetitive especially if you have enough ammunition and a powerful weapon. Surprisingly, there is only a single boss battle throughout the entire single player campaign. Defeat this boss and the credits will roll, indicating your completion of the single player campaign. As far as boss battles go, it was a little disappointing. There was no unique element and it was simply a case of wait, hide, and attack. Follow the sequence, shoot when appropriate, and you will have succeeded. To assume the game is easy would be an overstatement. Throughout the ten levels, and several hours of gameplay, you will be driven to the end of your tether with some significantly challenging level designs. That by no means infers a negative experience. In fact, it is good to have a challenge. So many games in recent years have been too easy to proceed, and complete in the single player campaign. Perhaps this is a reason why many of these titles now enlist a very polished set of multiplayer options, in order to add complexity and continued challenges. Multiplayer, both online and locally, is supported with the usual feature set that includes capture the point, free-for-all, team death match, freeze tag, capture the flag, and InstaGib. Gamers will also enjoy the live chat capabilities between opponents (voice chat is only available on iPad 2, the new iPad, and iPhone 4S). With the ability to have up to 12 players in a online game, this is a serious attempt at multiplayer via iOS. There is no shortage of available multiplayer games or opponents. Although, you may find yourself, as I did, in a situation where high ping rates meant that despite thinking I accurately eliminated an opponent, they in fact were able to gain the upper hand. When you do have success in achieving a solid and responsive data connection you will be able to compete against your opponents in seven multiplayer maps. All maps load quickly and are as stunning, and vast, as the single player campaign maps. To keep the multiplay scene lively, Gameloft has integrated a leveling system. It not only allows bragging rights, but in order to update weapons and your characters’ defenses, you will need to play, earn points, and then purchase the upgrades with this virtual currency. If you wish to fast track your progress, you can make in-app purchases that will apply to both single and multiplayer game modes. Overall, the game is immersive and exceptional value for the level of gameplay it delivers. It is disappointing that some faults do exist, although if you persevere the rewards will be worth it. Therefore, I am awarding this iOS game a MyMac.com rating of 7 out of a possible 10.